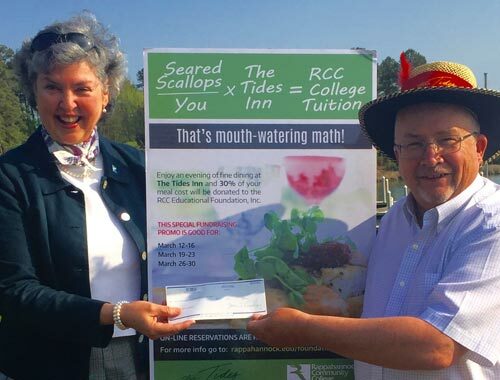 Tides Inn General Manager, Gordon Slatford, presents RCC President Dr. Elizabeth Crowther with a donation check for the RCC Educational Foundation, Inc.
Over a three-week period in March, the Tides Inn restaurant in Irvington, Virginia, participated in a special fundraiser where 30% of their meal checks were donated to the RCC Educational Foundation, Inc. (RCC EFI). Thanks to 420 dinner patrons, the special event raised $4,843 for the Foundation. 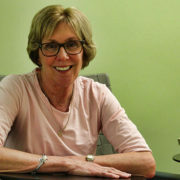 Each evening of the program, a local community leader filled the role of “guest host” to welcome diners participating in the fundraiser. Guest hosts included Jane Crowther, Dr. Crowther, Arabella Denvir, Patricia Gallagher, Gary Hooper, Ron Mihills, Rebecca Nunn, Sarah Pope, and Martha Tallent. 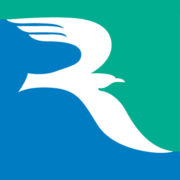 Funds raised by Dine for a Cause help the RCC EFI carry out its mission, which is focused on providing affordable, accessible, and high-quality education at RCC to the residents of the Northern Neck and Middle Peninsula. 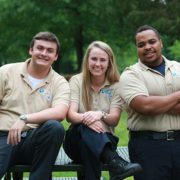 The Foundation will administer $400,000 in scholarship awards to over 200 RCC students during the upcoming academic year. The Foundation also provides funds to strengthen RCC academic programs that are not fully supported by state allocations. The Tides Inn was named the #1 resort in the eastern region by Virginia Living magazine and the #7 resort in the nation by readers of Conde Nast Traveler.